Do you ever come up against teams with a single dominant player? One player that scores a majority of their team’s points every game? When you do come up against a team like that, it’s the perfect opportunity to implement the box and 1 defense. 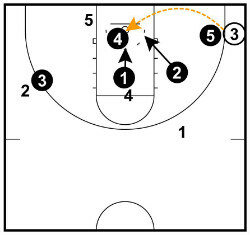 The box and 1 defense is a junk defense commonly used against teams with one great offensive player surrounded by players of less offensive talent. Quick Note: For those that aren’t familiar with the term, a ‘junk defense’ is a defense that combines man-to-man and zone principles together. The defense involves one defender (the chaser) playing man-to-man defense on the opposition’s best offensive threat while the other four defenders set up in a box formation and play zone. The main objective is to disrupt and confuse the opposition by giving them something they’ve rarely played against and force them to adjust their entire offense accordingly. 1. Causes Mass Confusion – By implementing a box and 1 defense, you’re forcing the opposition to run an offense completely different to their normal playing style. Having relied on their star player to do a bulk of the scoring throughout the season, the other players will now be forced to attack and contribute to the scoreboard. Forcing the opposition to make massive changes to their game-plan is always a good thing for the defense. 2. Their Star Player Will Get Frustrated – Imagine how frustrating it will be for their star player (who usually dominates the basketball) to be unable to get open while their teammates pass the basketball around and take shots. This will often lead to the star player committing silly fouls by pushing off to get open, getting angry at their teammates for not getting them the basketball, and they’ll often take bad shots when they finally do get the basketball in hopes to get on the scoreboard. 3. It Will Fatigue Their Star Player – If the chaser performs their job properly, the opposition’s star player will have an incredibly tough time trying to get open which will lead to them getting fatigued quickly. This is why I recommend rotating 2 or 3 defensive players through the chaser position so that they can all give their 100% effort at all times and then get a quick rest. 4. 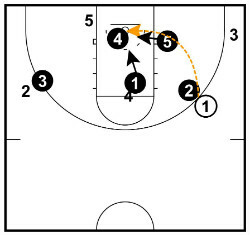 Easy to Implement – There’s not an easier zone defense in existence than the box zone with 4 players. Everyone’s roles are obvious and it won’t take long for your players to understand it. This allows you to teach the defense to your players before or during a game and you won’t need to spend 8 hours of practice time teaching it to them. 1. Middle of the Zone – The middle of a zone is always the most vulnerable position on the court for the offense to exploit. It’s imperative that your weak side players are always in the correct position to deny the pass into the middle of the zone. 2. Doesn’t Work as Well Against Star Big Men – This defense works best against a player that scores a majority of their points from the perimeter or off the drive. If their star player scores a majority of their points from inside off post ups, the box formation can make the key too crowded and less effective. 3. Can’t be used against great shooting teams – Since there are only two players guarding the entire three-point line excluding the corners, the opposition is going to get some open shots. If you’re playing against a team with great shooters, this defense won’t be your best option. 1. Star Player’s Touches Must be Limited – The entire defense is centered around keeping the basketball out of the opposition’s star player’s hands. The chaser must be in complete denial the entire time and not worrying about anything else. 2. Three Box Players Must Rebound – Whenever a shot is attempted by the opposition, there should be one person contesting the shot and three players forming a triangle around the rim for the rebound. 3. 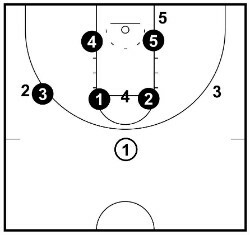 Everyone Collapses When the Star Player Gets the Basketball – When the star defender does get the basketball, all 4 box defenders must collapse back into their box positions. This is the player that is given the difficult task of guarding the opposition’s star offensive player. Their only role is to make the game as difficult as possible for the opposition’s star player. They do this by being in complete denial whenever the player they’re on doesn’t have the basketball. They don’t need to worry about being in help position, they don’t need to worry about rotating… their only focus should be keeping the basketball out of the star player’s hands. This player must be a smart defender and willing to work incredibly hard. They must also be disciplined because the star player is going to get frustrated and push off, throw elbows, talk trash, etc. The chaser can’t react to any of it. They must keep their cool and continue to defend smart. 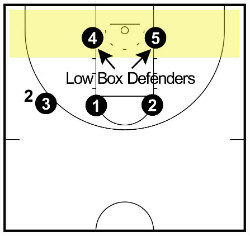 The low box defenders are in charge of defending the low post, defending the basketball when it’s in the corner, and always being ready to help if they’re on the weak-side. They must also be great rebounders. These players must be prepared to front the post whenever the basketball is on their side of the court and understand that it’s always a requirement for them to crash the boards hard unless they’re contesting a shot. 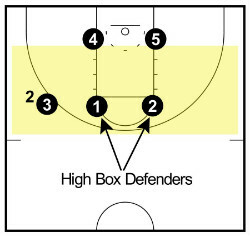 The high box defenders are in charge of keeping the basketball out of the high post and defending the perimeter whenever the basketball is on their side of the court. These defenders are preferably quick and good on-ball defenders since they’ll be required to do a lot of sprinting around the court! If a shot is taken and they’re not the player contesting the shot, they must also go after rebounds. The first step to running the box and 1 defense is to decide which of your players is going to take on the task of being the chaser. Once you’ve decided on the chaser, of your other four players, you will usually assign your two tallest to be the low box defenders, and the two shortest to be the high box defenders. Although this doesn’t always need to be the case. The coach must decide what’s best for the team! In the following paragraphs, I’ll speak mostly about the box defenders since we know what the chaser should be doing at all times… denying the basketball to the star player! When their star player manages to receive the basketball (which will happen), all box defenders immediately collapse into the original box set depending on where the basketball is on the floor. This box formation gives us great help defense all over the court if the star player decides to attack. An added benefit is that this will leave their teammates open on the perimeter which will encourage them to pass the basketball. Players know that they’ll look like a selfish player if they’re not passing to their wide open teammates. This is a good thing for the defense. We want the basketball out of their hands! When the basketball is at the top of the key, there will not be a specific player defending the basketball. The two high box defenders will be near the high post deterring the player with the basketball from making a pass into the middle of the zone. We allow them to pass the basketball around the perimeter. The two low box defenders should each have a foot inside the lane on their respective sides. The chaser will be in complete denial. When the basketball has been passed to a wing player, it’s the strong side high box player’s responsibility to close out and defend the basketball. Since we just want to keep the basketball outside the key, they should have an even stance and not be pushing the offensive player to a specific area of the court. 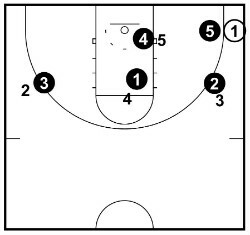 The weak-side high box player will slide across to the middle of the lane and deny the high post. The strong-side low box player must fight their way to front the post and the weak-side low box player should slide across to split line so that they can prevent any lob passes over the top. We always want the strong-side low box players fronting the low post because if the basketball is passed to the corner, it’s their responsibility to close out and contest the shot. When the basketball is in the corner it’s the responsibility of the strong-side low box player to close out and defend the basketball. It’s important that this player doesn’t allow them to drive along the baseline. The weak-side low box player must slide across and defend the player on the low block if there is one. If not, they’re in help position. The weak-side guard drops into the gap and denies the pass into the middle of the key. 1. 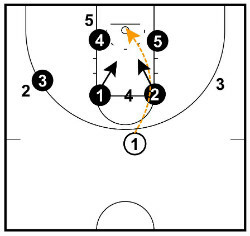 Drop back – This will prevent any pass inside the key from the corner but will allow the offense to pass the basketball back out to their wing player. 2. Hard deny the wing player – If you’re not playing against a smart offensive team that will cut into the open space, you can consider hard denying the reversal pass and see if you can force the offensive player to make a tough pass and turn the basketball over. Although this will leave a big hole in the middle of the key! 3. 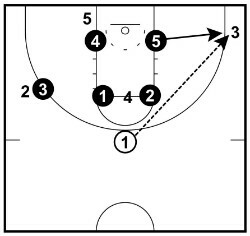 Trap the corner – I don’t often recommend trapping the corner in the box and 1 defense but it can be done. When the pass is made to the corner, the strong-side high box player immediately drops down and double the corner, the weak-side high box player sprints across and denies the reversal pass, and then it’s up to the weak-side low box player to intercept the pass to one of the other two players. The chaser will, as always, be in complete denial anywhere on the court. When the basketball finds itself at the high post I prefer to double with the high box defenders than to bring another defender up. 1. We don’t want to leave a single defender to cover the entire baseline. 2. A box and 1 defense shouldn’t be run against great shooting teams so a couple of open outside shots is better than giving away a layup. At the end of the day, when the basketball gets into the high post, it’s a pick your poison scenario. That’s why we need to fight hard to keep it out of there! The low box defenders should hold their ground on the blocks and not allow the dump down pass. 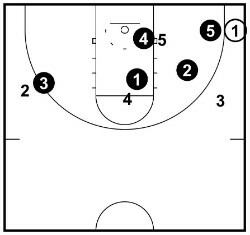 The high box players will double the high post and then scramble to recover. The low box players must do everything they can to ensure that a post player doesn’t get a seal on them in the low post. Your players should always be fronting the post or, at least, nudging the post player out if they have position. If the opposition gets a seal on the strong-side defender, we play them straight up and hope they don’t take advantage of the open corner three-point shot (again, we have to pick what we give up with this defense). If they do kick it out to the corner, the strong-side high box player can challenge the shot if they’re sure the opposition will take it. When this happens, both low post players must box out their players and secure the rebound! Rebounding in the box and 1 defense is actually quite good for a zone. The reason for this is because there will be an obvious rebounding triangle after each shot is taken from outside as you’ll see in the following diagrams. Whenever a long shot is put up, 1 of the box defenders will contest the shot and the other 3 must crash the boards and go after the rebound. 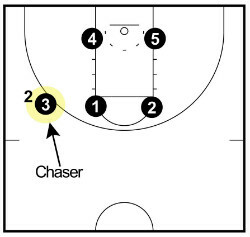 The chaser should always box out their player and keep the away from the basketball. This will keep their star player frustrated and they will often pick up a few silly fouls trying to get the basketball. When the shot is taken from the corner, the strong-side low box defender will contest the shot. The weak-side low box defender will be in charge of rebounding on the weak side since this is where the shot has the highest chance of landing if missed, the weak-side high box player will rebound from the top, and the strong-side high box player must cut down and rebound on the strong side of the triangle. When the shot is taken from the wing, the strong-side high box defender will contest the shot. This leaves both low post defenders to box out and rebound on their respective sides while the weak-side high box player must attack the top of the rebounding triangle and go after the rebound. When the shot is taken from the top of the key it’s a little different. If the shooter is shading to one side of the court and one of the high post defenders thinks they can get a hand up to contest the shot, they should do it and then the other high post defender rebounds from the top. If none of the defenders can challenge the shot, both should turn and rebound. If there’s an offensive player on the high post during this shot, make sure one of your high post defenders gets a body on them and boxes out! Defending skip passes is incredibly simple in the box and 1 defense although not always incredibly effective. If the basketball is skipped across the court, the player who is tasked with covering that area must simply hustle and close out. Simple, isn’t it? This is another reason why it’s difficult to use the box and 1 defense against a good shooting team. Let’s go over the three most common skip passes. 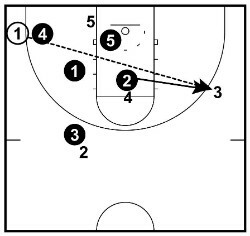 When the basketball is skipped from the wing to the corner, the weak-side low box defender who was on split line must hustle to get out and contest the shot. It’s crucial that this defender does not give up the baseline drive when closing out. 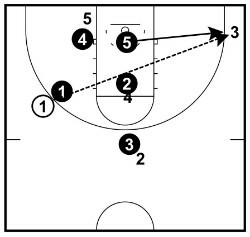 On the corner to wing skip pass, the weak-side high box player will close out on the player with the basketball. We want this player closing out evenly and not directing the offensive player to one side or the other. It’s better to give up a contested long-range shot than allow them to blow past us. On the top to corner skip pass, the closest low box player must close out on the basketball without giving up the baseline drive. This pass can be a killer for the defense if the low box player is screened. This is why your players must always be on their toes anticipating screens and getting the best position. The diamond and 1 defense is very similar to the box and 1 except that instead of the four box players setting up in a box formation, they set up in a triangle formation. This allows much better protection around the perimeter since there will be 3 defenders instead of 2, but gives much less help on the inside since there will only be 1 inside defender. Teams who decide to go with the diamond and 1 will usually have and incredibly dominant big man or be a team that’s playing against a team of great outside shooters. The biggest weakness for this defense is when the opposition gets the basketball into the high post, preventing inside scoring, and also rebounding the basketball. 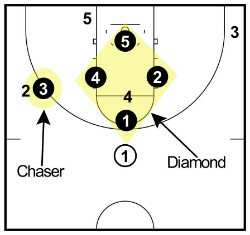 The top of the diamond will cover the basketball when it’s at the top of the key and also deny the high post when the basketball’s anywhere else on the floor. 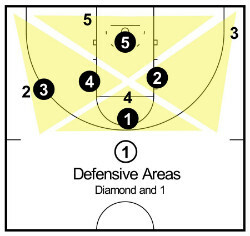 The two wing defenders of the diamond and 1 zone will be required to defend the entire wing on their respective sides from the high wing all the way to the corner. The inside defender will be must be great at protecting the rim above all else. They will be required to defend both blocks, rebound, and challenge any shot around the rim. By implementing the box and 1 defense, you force a one-dimensional team to beat you with their players that don’t usually make an impact on the scoreboard. The box and 1 defense does this effectively by causing massive disruption to the offense. This isn’t a staple defense you should use every game. 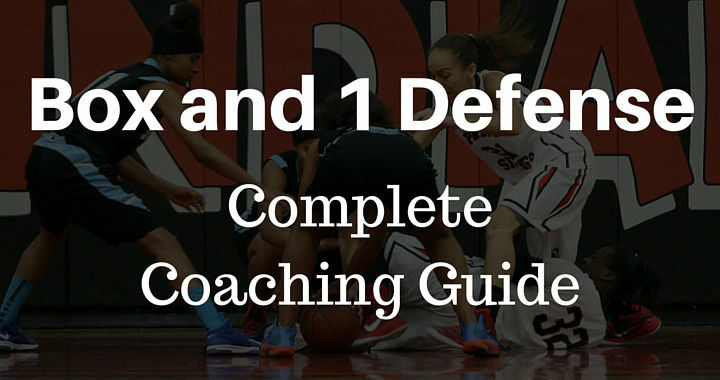 This defense should be used only against certain teams where you think it will be effective. You might not use it a lot, but it’s a great defense to have in the back of your mind. Who knows, you might need it one day!